Dental implants can be a life-changing decision, but many question what the total cost will amount to and if implants are worth it. There is no hiding the fact that dental implants can get expensive; they range in price from $1,000 all the way up $7,500 depending on the type of implant and how many implants are needed. Most implant surgeries range between $3,000 to $5,000 per tooth. However, their cost is generally not that much greater than other treatments to restore a tooth. They may even cost less than other replacement options because implants can last for a lifetime. Be wary if a provider gives you a cost for an implant without seeing your mouth. Dental implants are customized and built to your mouth, and any dentist experienced in implants knows that no two patients have the same dental implant treatment. Also make sure you are working with a credentialed dental implant dentist, which means they have the proper training, proven experience, and information that can help keep the cost of your implants at a minimum. As we explain the cost behind implants, it’s important to remember that implants are medical devices surgically inserted into living tissue, which is home to nerves, blood vessels, and sinuses. More → Attend a free dental implant seminar. It’s no secret that more experienced dentists in the implant field perform more successful surgeries than their less-experienced counterparts. That’s because dental implant placement requires a high level of precision and technique. While more experienced dentists may not charge more for their expertise, you can be confident that your implant will be less likely to give you problems in the future. Standard implants are designed to accept a variety of abutments and allow for complete customization of the teeth. They usually cost about $1,800 per implant. The fee decreases with multiple implants placed at the same time. A single implant crown fee is about $1200. 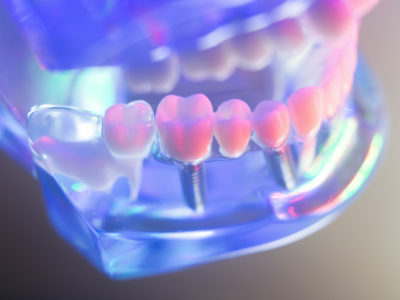 The price of hybrid, or full set of implant supported teeth will vary greatly based upon several factors, including the number of implants required, bone grafting requirements, type of replacement teeth selected, use of computer guided surgery, complexity of the case, and upper versus lower jaw. Fees generally range from 5,000 to 25,000 per arch. If bone augmentation is necessary to support the implant, it will may add some cost to the treatment. When cared for properly, implants may last a lifetime and help maintain your oral health by stimulating the jawbone. While dentures are a lower cost option than implants, they need to be replaced every 5-10 years and come with a variety of potentially awkward social encounters and do not really replace the proper chewing of natural teeth. Unlike implants, dentures speed up the bone-breakdown process in the jaw, changing the look of your face and giving you an aged appearance. Mayo Clinic studies found that people with teeth live, on average, 10 years longer than people without teeth. With all the different factors described above, the cost of an implant starts to make sense. However, beware of practices that you find on either extreme end of the spectrum. There is little justification for the total cost of a single implant and crown (without a bone graft) to exceed $5,000. Likewise, practices charging under $1000 for both implant and crown should also raise concerns. Price may be a factor in your decision making process, but make sure that you are receiving a quality implant from an experienced dentist first and foremost. Most insurance plans do not cover dental implants, but that has been changing in the past decade. However, your insurance company may cover the teeth that are placed on the implants, even if they don’t cover the implants. Call your dental insurer for complete and accurate information. If you’ve been considering dental implants, schedule a consultation to speak with Dr. Hale and Dr. Frost, who have placed hundreds, if not thousands of dental implants, over the course of 20 years and both have fellowship degrees in dental implants. Dansville Dental Professionals also offer free community seminars for those looking to learn more about implants. We’ll be happy to answer any questions you may have! Join thousands of others who have regained their smile and their confidence. Fill out the form to schedule a consultation with one of our dentists.